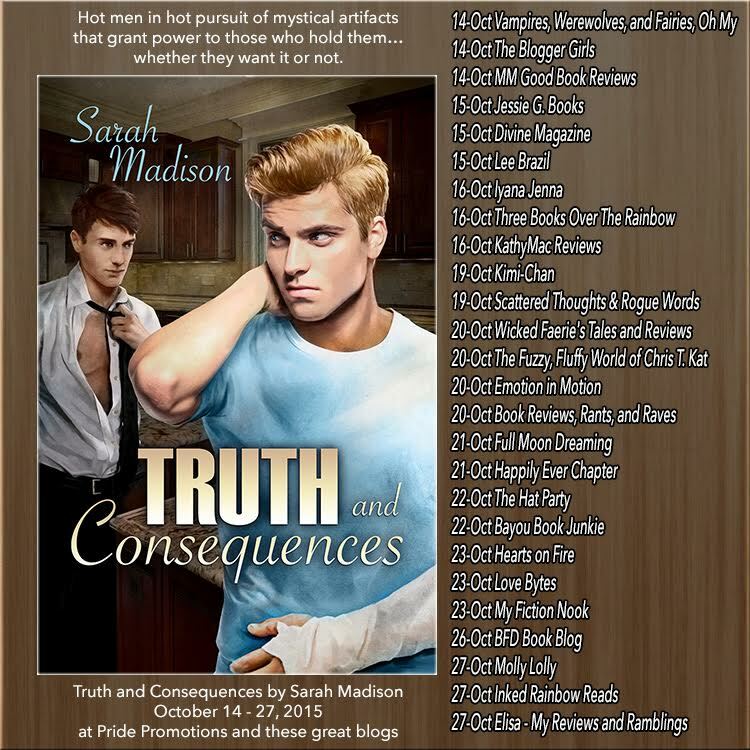 Release Day and Book Tour for Truth and Consequences by Sarah Madison! If you can’t tell, I’m pretty excited right now. Today is the release day for Truth and Consequences (Sixth Sense series, Book 3) and the launch of a two week book tour! I don’t know about you, but it feels like I’ve been waiting forever for this book to be released! But the day is finally here, and I can’t wait to share this story with you! Here is the schedule, if you’d like to join in the fun! I’ve got three stops today: Vampires, Werewolves, and Fairies, Oh My!, The Blogger Girls, and MM Good Book Reviews! Drop by and leave a comment. I’ll be giving away a free copy of Unspeakable Words (or if you have that already, something from my backlist). This entry was posted in Uncategorized and tagged book tour, contests, Dreamspinner Press, gay romance, GLBTQ, paranormal, promo, Sarah Madison, The Sixth Sense Series, Truth and Consequences, Unspeakable Words, writing by Sarah Madison. Bookmark the permalink. HUGS to you and good luck! I’ll spread the word where I can, but this is a brilliant book and you deserve every possible success with it! Sarah Madison recently posted..Release Day and Book Tour for Truth and Consequences by Sarah Madison! My preorder downloaded automatically last night! I’m so excited! I will be trying to sneak-read at work! Hah! It will be payback for all the times I’ve had to sneak-read your stories at work! 😀 Thanks for making me smile this morning!